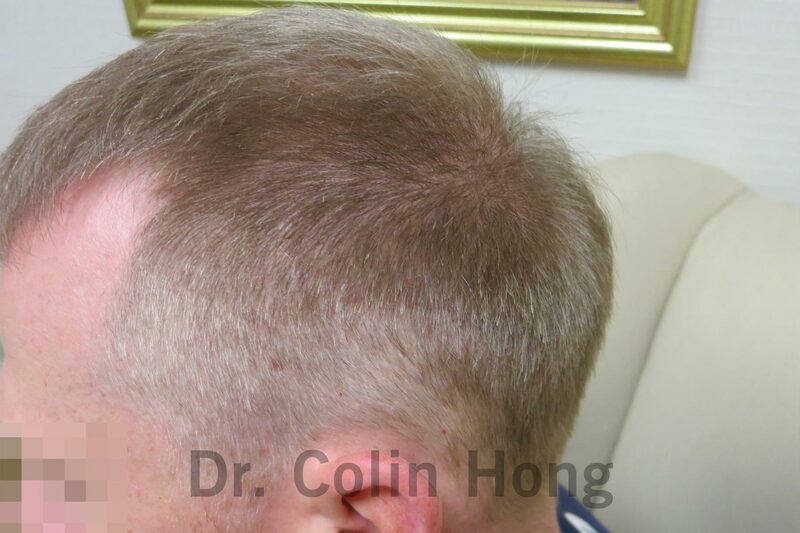 Follicular unit extraction (FUE) is a method of hair transplant that harvests viable follicular units (hair follicles) from a patient’s donor area, one at a time, to provide that patient with units that can then be used to create full hair restoration. At Dr. Colin Hong’s, this procedure is a two-phase process (not including time to heal) that encourages swift recovery and minimal discomfort. Our Toronto-based hair transplant clinic is renowned for creating natural FUE hair transfers in a professional and discreet environment. WHAT CAN FOLLICULAR UNIT EXTRACTION DO FOR PATIENTS? Follicular Unit Extraction (FUE) makes it possible for men and women suffering from androgenetic alopecia to experience an affordable solution to hair loss treatment. WHAT IS THE FOLLICULAR UNIT EXTRACTION PROCEDURE? FUE is one of two methods of extracting and transplanting hair follicles. 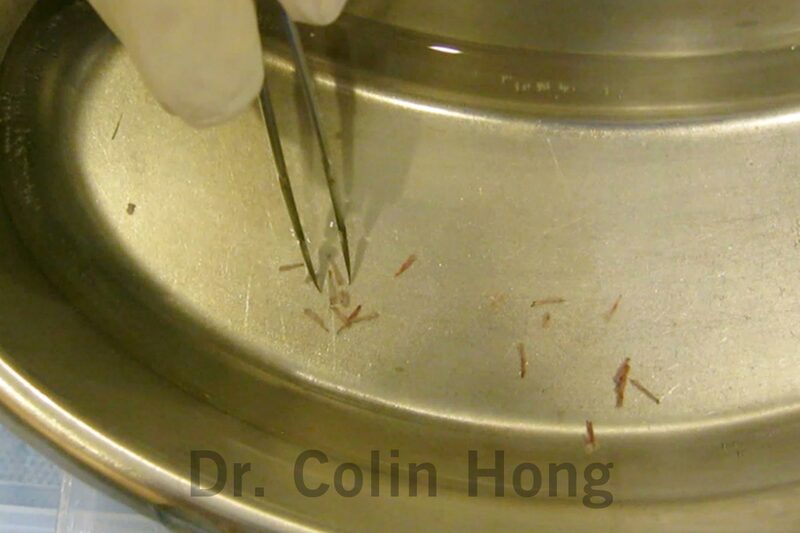 Unlike strip harvesting (which extracts a strip of skin to dissect individual follicular units), FUE extracts individual follicles directly from the patient’s donor area. FUE produces less scarring and more natural results. First, we begin by giving the patient a mild tranquilizer, either orally (Ativan) or intravenously (Versed), to minimize anxiety, reduce discomfort, and help to prevent, or decrease, any side effects that the anesthetic may cause. Next, we anesthetize the donor area and the patient with a local anesthetic using a very small gauge needle (typically a 30 gauge, a needle smaller than most acupuncture needles). This is the only uncomfortable part of this procedure. Many patients express that this part of the FUE process causes less discomfort than a visit to their dentist! But, for patients who are wary of needles, we can provide an inhalational anesthetic to provide zero pain. Once the anesthetic has taken effect, our FUE technicians use a special motorized punch extraction tool to harvest each of the donor FUE units. At Dr. Colin Hong’s, we conduct FUE’s using a “stick and place” method for transplanting harvested FUE’s. This provides a completely natural result with zero visible scarring. Because we use smaller sized grafts, treatment will be less noticeable post-operation and as one goes from session to session, will leave a natural result with zero visible scarring, and will be a pain-free experience. Once the transplant is complete, our grafts are held in place by coagulated blood and a light, but secure, turban-like bandage that may be applied, if necessary, after the operation and left in place overnight. The following day, the bandage is removed, the area is cleansed, and the hair is washed. In general, we do not find it necessary to use a bandage for our patients; however, in some cases, we can provide a bandage if need be. 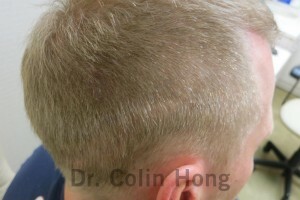 If you are having the front half of your scalp transplanted, and if there is no more than the average amount of bleeding during surgery, and you are willing to remain in the office for 2 additional hours after the procedure is completed, you can go home without a bandage; however, most patients prefer the security of an overnight bandage. Patient’s who prefer no bandage must book their appointments for a morning session only. Furthermore, you should still return the following day for a professional follow-up cleansing, hair washing, and check-up.